By mechanically grinding the concrete with diamond abrasives, Riverbed Concrete creates a smooth concrete finish that doesn't just provide a cover on the concrete, but actually polishes the concrete itself until it's smooth and sleek. Polished concrete is a very durable product that requires very little maintenance, making it a great option for high traffic commercial areas, and the ability to add color and create a very personalized finish makes this a great option for homeowners as well. 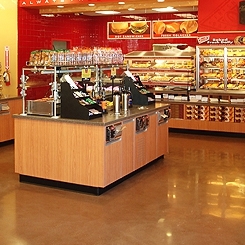 Popular uses for polished concrete include convenience stores, fine custom homes, restaurants, retail stores, municipal buildings, and schools. Riverbed Concrete also provides consulting services for a variety of concrete flooring applications including polished concrete. Polished concrete Texas, concrete polishing San Antonio, South Texas polishing concrete, polished concrete Central Texas. Polished concrete is hardened and densified concrete brought to a shine using diamond abrasives. The design options for polished concrete are endless, including scoring patterns, colors, embedded aggregates, stencils, and different sheen levels. 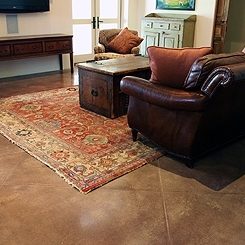 Polished concrete is popular in commercial applications due to its low maintenance and high durability. What are the finish levels for polished concrete? Class I: Low Reflectivity, 400 grit - The lowest finish level, this results in a surface that exhibits a low sheen level. Class II: Medium Reflectivity, 800 grit - This results in a surface that exhibits a moderate level of specular reflectivity. Class III: High Reflectivity, 1500 grit - This results in a surface that exhibits a high level of specular reflectivity. Class IV: Highest Reflectivity, 3000 grit - The highest level of reflectivity that exhibits an incredibly high level of reflectivity. What are the grades for polished concrete? Grade I: Cream Finish - Typically, a Grade I finish only exposes the sand particles in the concrete floor. This is a honed and polished concrete surface. Grade II: Salt & Pepper Finish - Riverbed Concrete's standard finish, this exposes a spattering of aggregate in the concrete floor. This is a hones and polished concrete surface. Grade III: Aggregate Finish - A Grade III finish exposes the greatest amount of medium and large aggregate in the concrete floor. This is a cut surface. What is the polished concrete process? Polish with a 800-grint resin-bond diamond. More resistant to high foot traffic. Resistance to moisture transmission issues: Polished concrete allows the floor to breathe and eliminates issues that arise with other flooring materials that seal off the concrete. High light reflectivity: Important for office buildings, hotels, restaurants, and other public facilities that want to project a bright, clean, professional image. Also saves energy by reducing artificial lighting requirements. 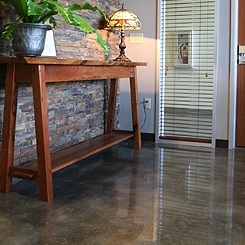 Is a sustainable flooring alternative: Polished concrete does not require hazardous coatings, cleaners or adhesives. How do I take care of my polished concrete floor? Check out our Care and Maintenance document for instructions on how to be maintain your polished concrete flooring. Polished concrete floors may look slippery, but they are completely safe to walk on when kept clean and dry. Polished concrete floors are the only concrete flooring system certified as High Traction by the NFSI.